White, mineral-based residues can ruin a tile installation. They come in various guises – from that chalky white grout haze left after an installation, to white blooms that rise up from a subfloor. As well as compromising appearance, they can also make maintenance really difficult. So, how can you remove them without damaging a tile or natural stone surface? Most of these residues can’t be removed with a standard cleaning product. They need something tougher. The problem is that acid-based solutions generally needed to remove minerals can’t be used on a lot of tile surfaces. If you attempt to clean an acid-sensitive material with a traditional acid cleaner, like ‘brick acid’, it will corrode the surface and effectively eat it away. Hydrochloric-based acids also emit harmful fumes and can damage certain metals, like aluminium trims around a shower enclosure. A safe and effective solution comes in the form of LTP’s new Cement, Grout & Salt Remover. This brand new product replaces conventional acid and, when used as instructed, is safe to use on all types of tiles – from porcelain to glazed ceramics – and all natural stone surfaces too, except for those with a polished finish. A diluted application removes mild mineral residue within 30 minutes, whilst a stronger application and agitation gives instant results. After treatment, just extract deposits with a sponge and rinse the surface with clean water. Wet vacs can also be used. As well as removing cement and grout, LTP’s new Cement, Grout & Salt Remover also disperses rising salt residues caused by efflorescence and spot fixing. Efflorescence is very common on outdoor surfaces, like bricks and patio pavers. It creates a powder-like dusting or ‘bloom’ on the surface. Efflorescence is caused by soluble salts and moisture rising from the ground or subfloor, or migrating through a wall. When they reach the surface they evaporate and leave a layer of salt deposits behind. Spot fixing creates a similar issue. Adhesive is often dabbed onto each corner and the centre of a tile to fix it onto a wall or floor. This creates a void between the adhesive, the tile and wall/subfloor. 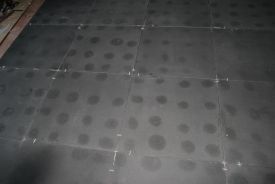 Moisture from the adhesive then collects in this void; minerals from the adhesive or concrete sub floor are then activated and they travel through to the tile surface, leaving a tell-tale ring mark or staining effect above each dab of adhesive. Natural stone floor that has been installed using spot fixing. Usually, an acid-based treatment like LTP Grout Stain Remover would be used to remove these marks from acid-resistant stone – but, where the surface is acid-sensitive, LTP Cement, Grout & Salt Remover now offers a safe and very effective solution.